This is one of the smallest little dolls I've made. 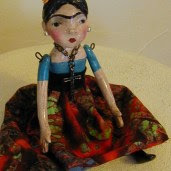 She is 3 inches long and is hand sculpted, hand painted and entirely hand made by me. She is for sale on ebay today. Good luck if you like Frida. Who doesn't?